Recent years have seen GPS receivers built in as a standard feature in many consumer products. A growing number of mobile phones, personal navigation devices, netbooks and tablets are equipped with GPS receiver chips and navigation software that enable consumers to navigate from A to B or find their nearest coffee shop. According to Berg Insight, annual shipments of GPS-equipped mobile phones are estimated to reach 960 million devices in 2014. Integration of a GPS receiver in mobile phones faces important restrictions, such as reduced space, interference from neighboring radio transmitters (oftentimes located in the same chip), low-cost oscillators, and poor antennas. Such factors make it a challenging task to deliver the navigation performance that consumers demand. Oblivious to all these limitations facing designers of GPS integrated circuits (ICs) and mobile phones, consumers expect their GPS receivers to work wherever their mobile phones do. We sometimes forget that the received outdoor GNSS signal in a mobile phone (around –135 dBm, and worse if the antenna is too small or badly located) is more than 1016 times weaker than typical transmitted cellular signals from the same phone (27 dBm). For these reasons GPS receivers in mobile phones are often augmented by using other sensors such as accelerometers, gyrocompasses, and even WiFi positioning data to aid the navigation function when the satellite visibility conditions are poor. We are also watching an explosion in the number of GNSS satellites available from multiple nations around the world. Besides the omnipresent GPS constellation, the Russian GLONASS system would have been complete if the recent Proton launch carrying three GLONASS-M satellites had not failed on December 5, 2010. Still, with 22 operational satellites (one spare satellite has been made operational) now in its planned 24-satellite constellation, GLONASS provides almost global coverage. Because of its slightly greater orbit inclination than GPS (60 degrees versus 55 degrees), GLONASS improves GNSS coverage in high latitudes. Of course, other GNSS systems, Europe’s Galileo and China’s Compass/BeiDou2, are under development. Moreover, local augmentation constellations are appearing, such as the Quasi-Zenith Satellite System (QZSS) in Japan, and several space-based augmentation systems (SBASes) have been completed or are being built in various regions: U.S. Wide Area Augmentation System (WAAS), European Geostationary Navigation Overlay Service (EGNOS), Japan’s MTSAT Space-based Augmentation System (MSAS), and India’s GPS-Aided GEO-Augmented Navigation (GAGAN) system. In this article, we discuss the architecture of single-die GNSS receiver chips. We also show the performance advantage of using multiple constellations, especially in environments where the satellite visibility is impaired. Two different L1 GNSS receiver ICs are used to illustrate our points. Both receivers can track satellites from GPS, GLONASS, SBAS and QZSS constellations. One of the receivers is part of a combination IC that also adds Bluetooth (BT) and FM functionality in the same die. In the architecture section, we show the main building blocks of a single die GNSS receiver as well as the necessary external components to implement a complete receiver inside a consumer product such as a mobile phone. We will also address two well-known system-level issues related to GLONASS. The first involves the inter-channel biases that are present in GLONASS due to the frequency division multiple access (FDMA) nature of its signals. The second is caused by the fact that GPS/QZSS/SBAS system-time differs from GLONASS system-time. Therefore, care must be exercised when mixing measurements from these systems and GLONASS into a single navigation solution. Finally, we will present results from test drives performed in deep urban canyon areas where initially only GPS satellite signals are used, and then we will show the improvements when the same receiver is augmented with GLONASS. Low-cost GNSS receivers are usually implemented using a single piece of a silicon wafer. This means all receiver circuits — for example, digital logic, memories, and microprocessors as well as analog blocks such as power supplies and radio circuits — are designed to use standard complementary metal oxide silicon (CMOS) processes that leverage economies of scale at IC fabrication plants. A single-die IC also benefits from modern wafer-level IC packaging techniques that bring the cost further down and speed up the testing process. Figure 1 (see inset photo, above right) shows a block diagram of a complete GNSS receiver inside a consumer product, consisting of a GNSS antenna, a GNSS band pass filter (BPF), a crystal oscillator, and the GNSS IC that, in this case, is represented by the GNSS section of the combo GPS/GLONASS/Bluetooth/FM IC or the stand-alone GPS/GLONASS IC. Both are equivalent from a GNSS functionality point of view. The complete GNSS solution is a highly integrated one and can be realized in a phone using about 25 square millimeters of board space — less than one-tenth the area of a U.S. dime. A few passive components are used in the design to improve matching and filter the different power supplies from noise sources. Let’s take a look at each of these blocks separately and consider the implications of having to support additional constellations with an emphasis in GLONASS because of its particular FDMA signal characteristics. We will first describe the components around the GNSS IC and then delve into the inner blocks of the chip itself as shown in Figure 1. Table 1 (see inset photo, above right) summarizes some of the signal-in-space differences between GPS/QZSS/SBAS and GLONASS that affect the design of combined GNSS chips. A GNSS receiver — whether a stand-alone GPS-only or multi-GNSS device, or integrated into a multi-technology product such as a smart phone — consists of numerous components. We will briefly review the main ones, pointing some of the particular factors that must be considered in designing a single-die chip. GNSS Antenna. 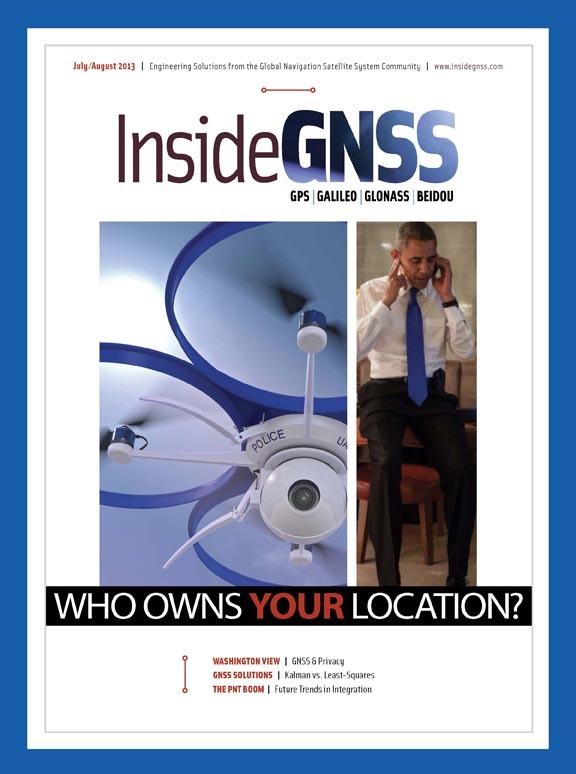 GNSS antennas in consumer products are very inexpensive items. A typical antenna used in mobile phones is a PIFA (planar inverted-F antenna), which is essentially a micro-strip antenna that is built using a piece of printed circuit board (PCB) trace so that the cost is negligible. GNSS Band Pass Filter. The use of band pass filters is a must for all GNSS designs that place the receiver IC in the vicinity of other radios. As mentioned earlier, GNSS signals are many orders of magnitude weaker than other radios present in mobile phones or even in the same GNSS IC. Crystal Oscillator. An external oscillator is used just as in stand-alone GPS receiver designs. This oscillator is compensated for temperature variations (i.e., a temperature compensated crystal oscillator or TCXO) so that the receiver can maintain greater frequency stability. Let us turn now to the various blocks of a GNSS receiver IC. We will cluster these inside the GNSS IC in the same three groups as indicated by the different colors in Figure 1: RF blocks, baseband blocks, and power blocks. Again, where applicable, we will point out differences from existing GPS-only solutions. RF Blocks. The RF section consists of the low noise amplifier (LNA), mixer, synthesizer, and intermediate frequency (IF) filter. The LNA amplifies the GNSS signal, adding as little noise as possible. That signal is then down-converted in the mixer to an intermediate frequency (IF). Baseband Blocks. The baseband section consists of an acquisition engine, tracking channels, and the microprocessor unit. The acquisition engine is able to search for a large number of delay/frequency hypotheses for both GPS and GLONASS signals. Once the signals are acquired, they are passed on to the tracking channels where the range, Doppler, and phase measurements are taken. Power Management Unit Block. The PMU block provides power to the various sections of the IC so that a single power source from the host can be used, employing internal regulators for each power domain. The design of the PMU block is not really different in a GNSS receiver when compared with a GPS-only receiver. The number of “line of sight” (LOS) satellites that a GPS/GNSS receiver uses in its position computation directly influences the accuracy of the resulting position. Modern receivers are very sensitive and can often receive many satellite signals in obstructed environments (even indoors). More often than not, these signals are reflected from buildings and other objects and often hurt more than help a receiver’s accuracy. Even though a GPS receiver would typically flag these satellites as having multipath, it has little choice but to use them because such environments simply do not admit enough LOS satellite signals to compute a navigation solution with these LOS signals alone. A common figure of merit for the resulting position error is the so-called horizontal dilution of precision or HDOP. In this section, we will compare the HDOP values from a GPS receiver that uses only GPS satellites with receivers that gain additional benefit from SBAS, QZSS and GLONASS. We will first show simulations of the satellites and HDOPs for receivers in virtual sites representing San Francisco, Tokyo, and Madrid. Later on in the section, we will show real data collected in San Francisco and San Jose, California, with equipment incorporating the GNSS/SBAS/QZSS/BT/FM IC. GLONASS signals undergo different propagation delays through the front-end hardware because GLONASS satellites transmit at different frequencies. This results in biased range measurements. These biases, known as inter-channel biases, are estimated based on knowledge of the hardware components used in the receiver. However, the biases cannot be completely calibrated in advance. 1. The GLONASS version of Coordinated Universal Time (still using the former Soviet Union designation UTC SU) is maintained in the Moscow time zone, which is +3 hours from the UTC to which GPS is referenced. 2. GLONASS is bound to UTC SU time. Therefore, when leap seconds are introduced to UTC, GLONASS system time is simultaneously adjusted — unlike GPS time whose delta to UTC time continues to grow. This currently accounts for a 15-second offset between the two system times. 3. A sub-second system time difference, called Tau GPS (τGPS), also exists and is described in the latest GLONASS Interface Control Document 5.1. This is a small offset that changes relatively slowly and is presently around 370 nanoseconds. We later performed another round of drive tests with an early release of the GNSS/SBAS/BT/FM product to quantify the benefit of GPS+GLONASS in a challenging urban canyon signal environment. A course was created through narrow streets of San Francisco, an area known for high multipath. A truth system was used to simultaneously provide a best estimate of the actual path traveled by the test vehicle. The truth system consisted of commercial equipment that combines a dual-frequency GPS/GLONASS receiver with a tactical-grade inertial measurement unit (IMU). The availability of multiple constellation GNSS receivers for consumer markets has long been anticipated. The years of waiting are now over with the introduction of the industry’s first single-die multi-constellation GNSS IC. The component has already been integrated into a popular smart phone and will quickly find its way into an array of other phones, personal navigation devices, cameras, and GPS watches. The theoretical advantages of multiple constellations are clear: a simple HDOP analysis shows that position accuracy improves with multiple constellations. It is pleasing to see that this theoretical advantage occurs in practice in the urban environments where GPS is most challenged. In an urban canyon with blockages everywhere, satellite visibility is a game of chance, and nearly doubling the number of available satellites greatly improves the odds of tracking enough satellites to keep a navigation filter running smoothly. In this article we have seen real-world examples of improved performance from multi-GNSS receivers in both modest and tough urban environments.